Does a grand play space in Paris point the way forward? Whatever side you take in the ongoing debate about virtual reality—whether it's the future of entertainment, and if so, what's holding it back—one thing is certain: It needs emotional buy-in from mainstream users, the kind augmented reality enjoyed when Pokémon Go conquered our streets. In response to that, Productman, the product arm of Paris agency Buzzman, partnered with Ymagis to unveil Illucity. Located in the city's Parc de la Villette, nestled under the shadow of a science museum, the double-decker space promises to be the Disneyland for VR, open and available to all. I had a chance to visit the space recently. In keeping with the Disney-like ambitions, to enter you must first pass through a dark corridor, lined with mirrors and colored dwarves—à la Snow White—wearing VR headsets. Colored lights and ambient sounds accompany every step before you penetrate the Illucity lobby, where the 3-D logo's been painted over the wall and desk, trompe l'oeil-style. I expected something resembling old laser tag arenas, but this is less like that than a lovechild between a children's gymnasium and an arcade, with vestiges of Alice in Wonderland. "We wanted to cultivate a universe that was innovative, but also benevolent and welcoming," François Phan, associate director of Productman's brand experience and innovation department, told Muse. Phan himself was inspired more by games like Monument Valley, which is the opposite of stressful and entirely ruled by tricks of perspective, than by renditions of VR as imagined by Ready Player One, which he considers a classically closed experience. To build Illucity, "we had to ask what entertainment would look like in five, six years," he went on. "It's not 'hype,' with lots of neons and tech; it's more retrofuturistic—playing on forms and illusions. We didn't want to speculate too much on tech and the future," which quickly feels dated, like Disney World's Futurama. François took me on a tour. A bright locker room invites people to place belongings in cubbies—some of which are fake, and open only to walls with eyes or similar gags. The bathrooms are dark and strobey, made for Insta-selfies. 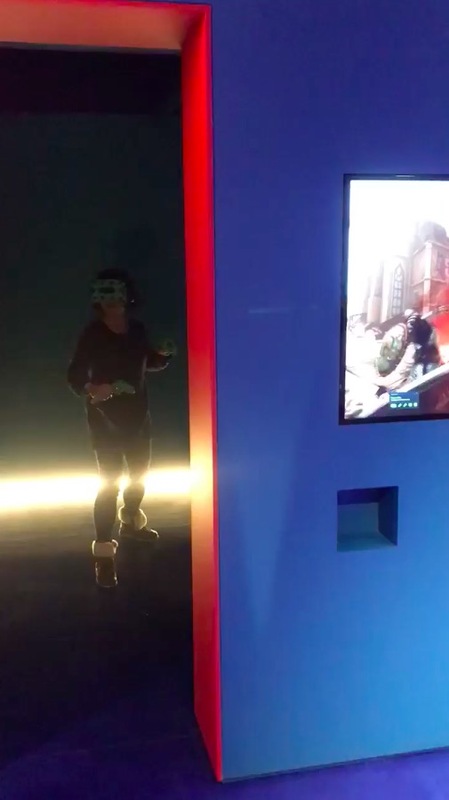 To enter the game space, you're subjected to yet another hallway, outfitted with false doors, peepholes for kids and flanked by a funhouse mirror. The gaming space is organized by rooms of various size (for single- or multi-player experiences), an arcade, a "Chill Area" for sitting and hanging out, and a windowed platform for the game masters, overlooking all and set up to feel more Daft Punk than A.V. student. Illucity took nine months for Productman to construct (Buzzman is taking over communications now that it's built), and spans about 10,700 square feet. The workers are friendly, knowledgeable and ever-present; they put the gear on you when you play, and clean it once you're done. Even as bright screens warn you what to expect—like to close your eyes if you feel nauseous—real people assure you that, should you ever freak out, all you need do is raise a hand to find someone ready to pull you out. While the setup is meant to last five years at least, "the gaming experiences are renewed every six months, which makes people want to come back," Phan explained. I played a couple of games at Illucity, which opens later this year: Knightfall, a single-player Crusades game; and The Raft, a multi-player experience where you shoot aliens on, well, a raft. Local leaderboards track how well you've done compared to others, arcade-style. Many Buzzman/Productman execs were also seeing Illucity for the first time. I played The Raft with Amélie Juillet, Buzzman's communications head, and Thomas Granger, its vice president. Granger and I don't know each other especially well, but the coolest thing about the experience was how little that mattered once the game started. "Amélie, take the back! Angela, up front with me!" he exclaimed, quickly learning he could hold two shotguns at a time, at which point he went ballistic. I manned some kind of cannon, and when Juillet wasn't shooting, she was—quite literally—putting out the fires I started when things went awry. Buzzman president, founder and creative director Georges Mohammed-Chérif observed, "Everyone takes on the role of a sociotype in VR; it's telling. There was a test game we did over a virtual volcano. Instinctively I took everyone by the hand and went, 'OK, I go first! '—like a leader! You take on a personality that's different, but also you." Virtual reality is a lot of things. Mostly, though, it can feel elitist and solitary. Watching somebody play a VR game on their own also makes them look stupid—the subject of not a few ads. Illucity plays on this while breaking that barrier down. "Let me show you something," Mohammed-Chérif said, tugging on my arm. I followed him to a wide window, behind which a group of people, armed and VRed-up, were playing an escape game. All the rooms are like this: They're windowed so you can see players act doofy, but they also feature screens so you can see the world they're in. "Do you always think of campaigns in terms of the viral element?" I asked, perhaps redundantly; Mohammed-Chérif named his company Buzzman, after all. He looked at me like I was silly. "Of course," he said. And yet the windows and the screens have the intended effect: You're not just a watcher witnessing the stupidity of others. You're part of the spectacle. This makes it both relatable and contagious. "It's the democratization of VR," Juillet told me. Phan, who approached again with an Illucity employee offering free candy—they're so nice here!—went into more detail. "First, existing VR experiences can be disappointing—whether Google Cardboard or Samsung, you don't really get great enjoyment or great resolution," he said. "Second, if you want to have a quality experience at your house, it's expensive: The equipment, the captors, everything you need costs a lot. Thirdly, you feel closed in. It's scary, cold, and very techie. Our objective is to open VR with a space that's colorful, crazy, mainstream." In fact, Illucity is less about VR per se than it is about illusions. "Illucity is a space of illusions; it's adaptable," François said, pointing out the trompes-l'oeil and the logo, which appears everywhere but looks different depending on where you're standing and how you look at it. From the weird mirrors to the colors to the décor, everything is both photogenic and playful. "We're uniting technology and popular entertainment. We're surfing VR, but the technology can evolve; if there's a game around illusions, that's great, we can do it here," Phan said. But Juillet's thing about the "democratization of VR" stuck with me. I asked Phan what it was like to build Illucity, and what work they did to ensure it didn't just appeal to tech nerds, ad people and hipsters. "Ymagis did the business model while we imagined the experience; we advanced at the same time," Phan said. Ymagis provides services and tech to the film industry. Their ambition was to build an immersive space that transcends gaming and makes VR mainstream, transforming themselves into VR entertainment gods in the process. "To develop the experience, I had to do analysis," Phan continued. "And at every moment we had to iterate, evolve our thinking. At first, the arcades were imagined as closed, and game masters were hidden … now everything is open." Productman focused on a series of personas—people aged 25-35, gamers, the B2B crowd (it's easy to imagine team-building workshops here) and parents, particularly mothers with their children. "We had to confront our analyses and compare it to those core users, and find ways to make decisions," Phan said. "What was your north star?" I asked. "Intuition played a role, otherwise you never make a choice," he admitted. "If everything is based on analysis, which is often conflicting with itself or with your vision, you never do anything. The concept was an adventure park that welcomed everyone. So we approached it with our marketing intuition, but iterated at every step." Democratization is plugged right into the model. People must register for games in advance, which they can do on their phones without an app; an SMS confirms purchases. While the "star experiences," which last a half-hour or longer, can cost around 30€ (about $34), arcade experiences cost just 5€ (about $5.70). Illusions, more than VR, speak to everyone, Phan continued. Location also plays a role: La Villette is closer to the edge of Paris, near the suburbs. "This isn't just for hipsters," Phan said. "Look at the dwarves in the entryway. Are those for hipsters?" Eh, depends on who you ask. Mohammed-Chérif said it was difficult to find a VR name that wasn't copyrighted worldwide but that was also "serious" in intent. The executive position on the project's development—nine months of build, and ambitious in the agency's history—was driven by the philosophy that the less involved they are, the faster things will go. "I took a distant view. I saw the mockups and evolution, but not too much. I wanted to be surprised," Mohammed-Chérif said. In the agency world, this may be the most impressive detail of all. For this reason, both Mohammed-Chérif and Granger had fresh emotions to share. "My first feeling upon arriving? You leave reality for a quarter of an hour," Mohammed-Chérif said. "That's what's crazy about VR: You walk through a door and enter illusion. You change atmospheres in two seconds." Granger, meanwhile, was bouncing around like a kid in a candy store. He wanted to try everything. "I'm a child inside," he laughed. "But there's a jubilant quality here; it makes you happy. It's very light, emotional. You forget yourself quickly." We talked about playing The Raft together. "There's something strange that happens in the mind, also intriguing in a positive sense, and also worrying in terms of loss of orientation, finding yourself in this virtual world," he mused. "What we just did was 100 percent entertainment. We were scared, because a monster arrived, but always felt safe. I think VR could create social experiences the same way it can make experiences that are more solitary"—here, Granger referred to After-H, a spaceship ride he'd just done. "When there's an interaction—like escape games—it can create new relationships between teams. It breaks down walls: You need each other to solve problems, so it's teamwork, but it's also competitive; I see you did better, I want to beat you, too. But there's no politics from outside." Four types of VR experiences currently exist at Illucity: "hyper-reality experiences" like After-H: Legend of Mars (about one hour, up to six players depending on the game); escape games like Assassin's Creed: Escape the Lost Pyramid and Curse of the Corsair (also about an hour, 2-4 players); arcade games like The Raft or Space Pirate Trainer (up to four players, depending on the game, with an average duration of 10 minutes); and VR games like Asteroids!, Invasion! and Out of the Blue. Illucity is also a reflection of Productman and Buzzman's aspirations. "In this universe you can create things that don't exist in life but resemble life, that you can feel. It opens a horizon," said Granger. Phan was bullish about opening multiple franchises over the next few years, providing an entry into esports. "Imagine tomorrow we open Illucity in Marseille. The people there can combat people in Illucity Paris!" he said. "It's location-based entertainment." "It's a foot within entertainment," Mohammed-Chérif agreed. "You create experiences for people that are themselves an ad for the product. The next step for us is to create games. A game for a client that would be a hit—the game that would be the best of Illucity. We discussed this, didn't we, François?" Illucity opens later this year, and will expand through France and internationally by summer 2019. People can book tickets on the website.